The polypoid clear-cell adenocarcinoma bordered by dark zone of adenosis which lies on the anterior vaginal wall. Another patch of adenosis occupies the posterior wall. 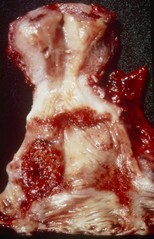 The vaginal adenosis and the extensive ectropion of the cervix appeared red in fresh state.